Americans are being spied on, but does anyone care? We all know that the American government (specifically the National Security Agency and the FBI) is reading our emails, listening to our calls and watching what we look at online. Apparently we don't care enough to do anything about it. 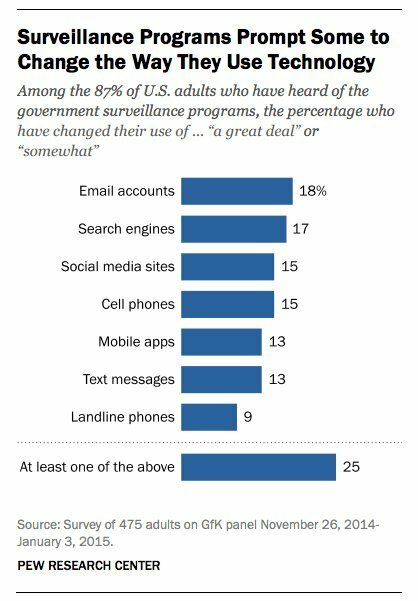 The Pew Research Center surveyed 475 U.S. adults between November and January about their views on privacy and discovered that Americans (thankfully) know that government surveillance exists. 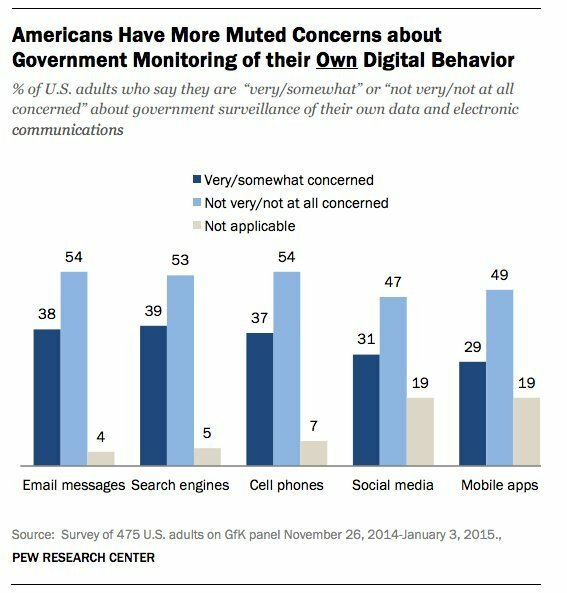 Almost nine out of 10 people surveyed said that they have heard something about government surveillance. Fifty-six percent said they have heard "a little" about it and 31 percent have heard "a lot," according to Pew's survey, released Monday. Eighty-two percent of people think it's acceptable "for the American government to monitor communications from individuals suspected of terrorist activities," and only 40 percent think it's acceptable for the government to monitor communications from American citizens. Fifty-seven percent think that's unacceptable. Americans may be disapproving, but they're not all that concerned. Only 17 percent reported that they were "very concerned" about government surveillance, while 35 percent were somewhat concerned, 33 percent were not very concerned and 13 percent were not at all concerned. Just because people think it's wrong doesn't mean they're sitting awake at night worrying about it, clearly. Another reason people are leaving themselves vulnerable is that they are intimidated by these anonymity tools. Fifty-four percent of people said that they think it would be difficult to find ways to protect their privacy online, according to Pew. If we know one thing, it's that people are lazy about security. As of 2013, around half of iPhone users weren't locking their phones with 4-digit codes. Plus, the most popular passwords every year are always ridiculously simple. The most-used password of 2014 was "123456," followed by "password" and "12345." Looks like there's an opportunity here for a simple privacy tool to swoop in and give some people peace of mind.